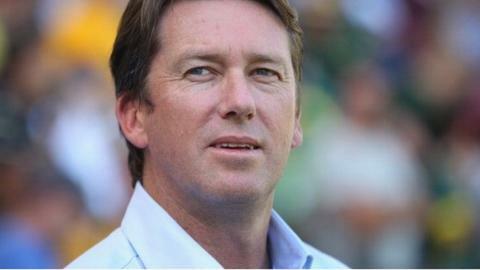 Former Australian cricketer Glenn McGrath says he regrets going on an African hunting safari in 2008 after pictures were posted on social media showing him posing with dead wildlife. The ex-fast bowler was pictured holding a firearm next to animals, including an elephant, two hyenas and a buffalo. McGrath said the safari in Zimbabwe was "in hindsight, highly inappropriate". "It was an extremely difficult time in my life and looking back I deeply regret being involved," he said. McGrath's wife Jane died of breast cancer aged 42 in 2008. The photographs were posted on social media although they were later removed. They show McGrath crouched beside what looks like a dead buffalo and two hyenas, and posing with the tusks of an elephant. "Images like these are heartbreaking, whoever is taking part in this cruel activity," said the World Animal Protection charity in a statement. "We're opposed to all forms of hunting and have campaigned for the end of wildlife hunting in various forms for decades." McGrath took 563 Test wickets - the most by a fast bowler - in a record-breaking career before retiring in 2007.